We have started our business activities in 1967, under the name “SONBAY CONSTRUCTION INC.” which was later incorporated into its present structure in 1993 with “İLKTAŞ CONSTRUCTION LTD.” to “SONBAY CONSTRUCTION CO.”. Since their foundations, with their safe and sound financial backup, both companies have completed major military projects, public buildings, educational buildings, health-care buildings, prestige buildings and many other unique projects both at home and abroad. The companies are both among the leading construction firms of Turkey with their highly experienced open minded employees operating with the most modern techniques and utilizing a fairly powerful fleet of construction machines. In final words, we truly believe that the SONBAYGROUP family will embrace the millennium ahead with world-wide achievements in all aspects and fields of business. MILESTONES OF A LIFE TIME…. As we are all going through a dynamic era, the whole business world around globe is questioning the same fact: Are we ready for the dramatic changes that we will encounter as we go on through the new millennium. In the 19th century, the average lifetime for a company was accepted to be around 100-150 years. When we came to 2000s, this period went down to single digit numbers. Even more dramatically, today, the average lifetime of a company is around 10 years because as we encounter the new developments like mergers and acquisitions, we will be facing a new form of global competition. For those who underestimate this era, the end will be either dissolution or transfer to another group. When I first started in 1968, I was very much sure that my business activities will be the true meaning of my life and will last a life time, now that I look back; we have come a very long way. There were times I wanted to give up but I did not because I always had full faith for my crew as much as my true feelings for this country. Nowadays, I feel honored to experience the on going changes in Turkey and how fast we are growing globally. However, in many aspects we fail to realize that we are at a milestone. Now is the time for every Turkish Company to utilize the opportunities provided by the new technologies and integrate these changes with the accumulation of knowledge and organizational skills gained by time, in order to generate best value and satisfaction to our customers around the world. As we are trying to be more efficient, it should be our commitment that the quality of our work will never change even through the toughest competition because this will be the key for on going operations. I truly believe that SONBAYGROUP family will embrace the millennium ahead with world-wide achievements in all aspects of business because true values and ethics will be our only torch through out this dark and long way. In final words, as the founder and chairman, I would like to thank everybody who has given their endless efforts and supports in order to achieve success, without them, all the milestones would have been different. Is to be the leader with the services that we provide by giving priority to the quality in design, manufacturing, construction, installation and project management and to complete the projects on TIME and with maximum QUALITY by employing well-trained and experienced professionals. Is to perform the jobs undertaken, in conformity with the international criteria, current regulations, specifications and standards, with high quality and profitability, in a specified time. We are aware of the fact that assuring the success and the future depends on the contribution of its employees, peaceful work atmosphere, security, and quality of work being done. By doing so, not only the top management but also our employees major goal will be performing our work effectively and efficiently. – The employees are informed about the procedures and the methods they shall follow to minimize the accidents. 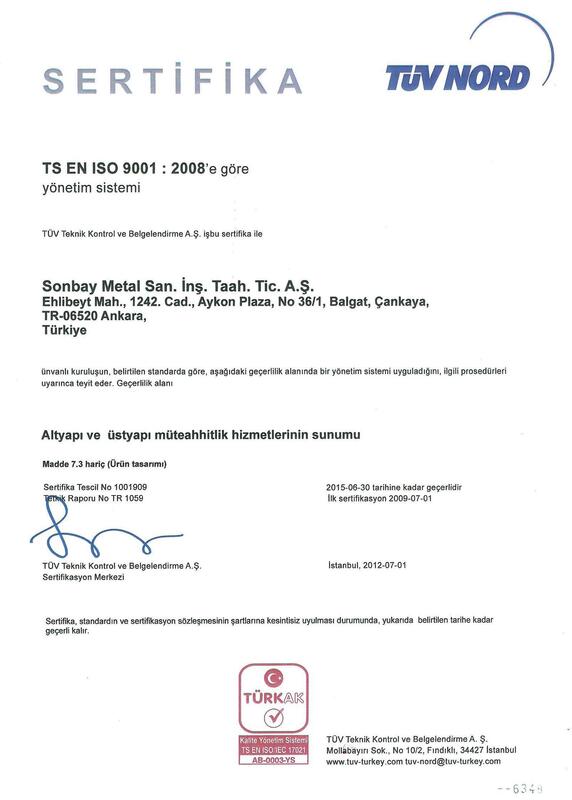 SONBAY METAL SANAYİ VE İNŞAAT A.Ş.